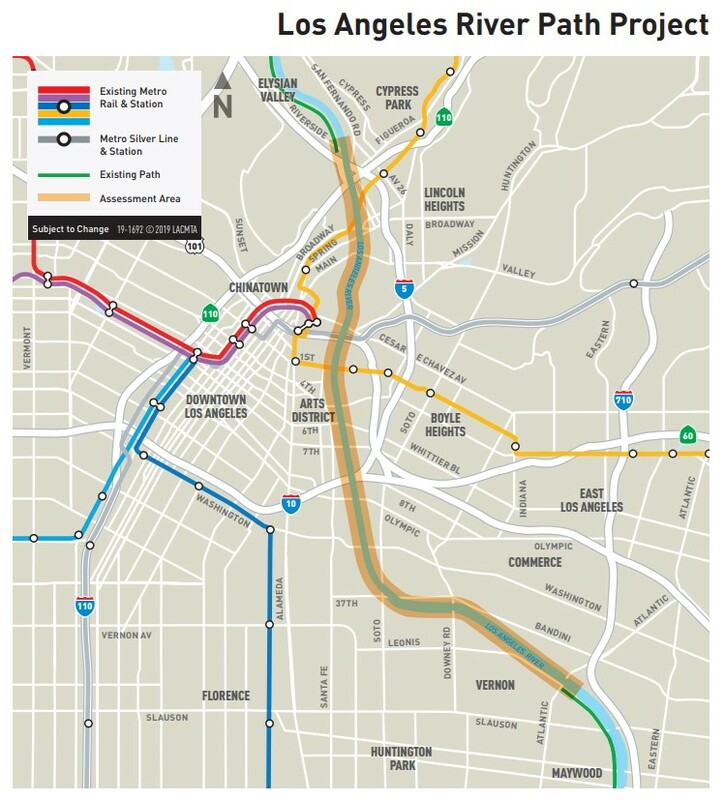 Metro is hosting community input meetings on its L.A. River bike/walk path gap closure project extending from northeast L.A. through downtown L.A. to the southeast cities of Vernon and Maywood. 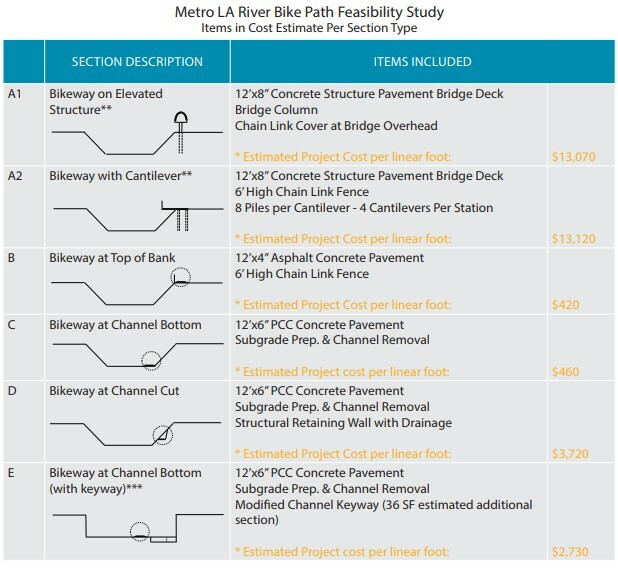 The river path 8-mile central gap closure project has $365 million in Measure M funding. The project will bridge the gap between existing paths to create a 30+mile continuous bikeway from Griffith Park to Long Beach. Measure M schedules the project completion date between 2025-2027. The multi-use bike/walk path is currently in the conceptual design phase, with environmental studies anticipated to begin this summer. Due to flood risk, this stretch of the river is all channelized in concrete, and currently off-limits to the public. It is planned for longer-term revitalization under several plans, including L.A. City’s L.A. River Revitalization Master Plan. The new multi-use path is likely to be an early phase of broader revitalization efforts. The central river path gap closure project presents a serious design challenge, as there is a great deal of infrastructure it will need to be threaded through: freeways, railroads, power towers, bridges (many of which are historic), and more. Through downtown Los Angeles, there is no existing maintenance road to convert to a path. Portions of the river – in Vernon and near the Arroyo Seco confluence – have vertical channel walls with little to no public right-of-way for a path along the top. Though there are many residential neighborhoods nearby, immediate channel-adjacent areas are nearly all industrial. For the current phase, Metro is hosting a series of three community input meetings. Last Saturday’s meeting, which took place in Boyle Heights, was disrupted by anti-gentrification activists. Find video of the protest at Defend Boyle Heights’ Facebook page. Last night, the second meeting took place at Southern California Institute of Architecture (SCI-Arc) in the downtown Arts District. There were about 50 attendees from the public. Metro staff presented results of an early input survey, and preliminary alignments – including various path cross-sections. Attendees were invited to give their input on the project, including places the path should connect with and their preferred type of path. 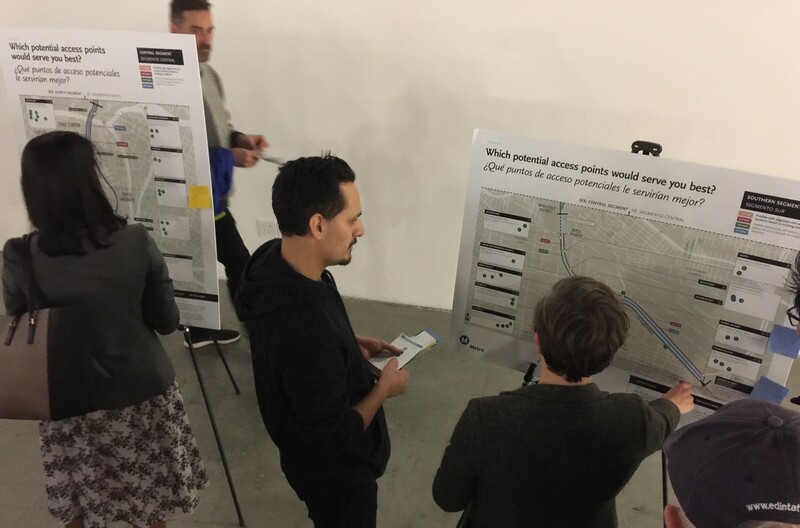 Attendees giving input at last night’s L.A. River bike/walk path project meeting. Photo: Joe Linton/Streetsblog L.A. There is one additional meeting scheduled in the current round. Interested folks should plan to attend next Thursday, February 7, from 6-8 p.m. at the Cypress Park Recreation Center at 2630 Pepper Avenue. Presentation begins at 6:30 p.m. This meeting was staffed by white folx and a few token POC. No Chicanos or local community members were involved in the plan.